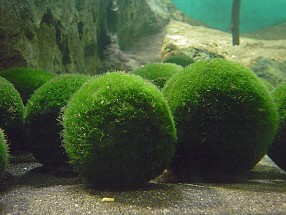 The Aegagropila linnaei, otherwise known as the Marimo Moss Ball, is a species of filamentous green algae that is known for its unique shape and smooth complexion. This plant is very popular in Japan that it is considered a National Treasure. They even name it and take care of them as pets. 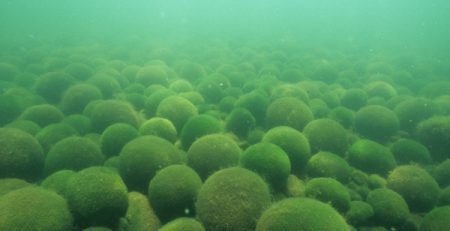 The Marimo Moss Balls were first discovered in 1823 by the Dr. Anton Sauter, an Austrian Botanist, in Lake Zeller, Austria and was soon discovered in Japan by Tetsuya Kawakami in Lake Akan. Marimo have not always had an easy life in the lake which serves the local community as a tourist attraction and a valuable water resource. Ironically, after the first governmental designation of marimo as a Natural Treasure in 1921, people came from all over the country to obtain these unique plants. Some were taken away as souvenirs by tourists and many others were stolen and sold for high prices in urban areas. Other damages were caused after a hydroelectric power plant was built along Akan River which flows out of the lake in 1920. 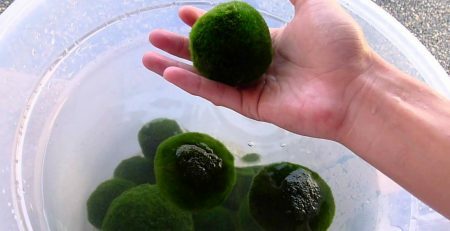 A number of marimo, which can survive only in the shallow water, were exposed and withered as a result of the lowered water level due to the use of lake water for generating electricity. In the 1940s, recognizing that marimo was severely endangered, the local people launched a campaign to protect the plant, one of which continues to this day, the Marimo Festival which originated in 1950. Held every October, when the autumn leaves on the lakeshores are at their best, the three-day festival is led by the local Ainu people, and culminates on the third day with a ritual in which a senior Ainu on board a small wooden boat returns the marimo one by one, carefully and thankfully, into the lake. The local government of Akan Town re-opened the Marimo Exhibition and Observation Center in 1996 after extensive renovation. The new center is equipped with various facilities to promote the environmental and scientific importance of marimo as well as research on the protection and propagation of the species. 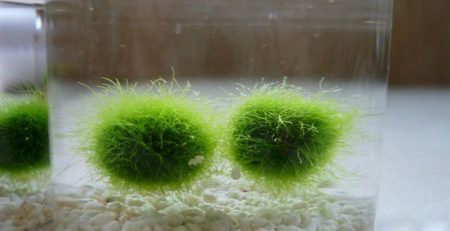 A Marimo Moss Ball can grow in three different ways. First, they can grow on rocks on which you can find them on the shady side of the rock because they cannot withstand high temperature. Second, Marimos can grow free floating and create a carpet-like surround at the bottom of the muddy lake. 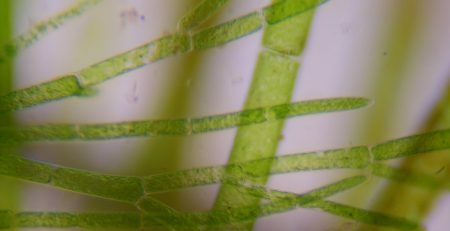 Lastly, they can grow just like a ball on which densely packed algal filaments in the center. Ensure that they are only exposed to minimal sunlight. Ensure that the water temperature is not high if you place them in a fish bowl. Rinse and wash them at least once a week. 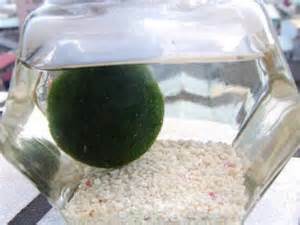 Marimo Balls have long life. They can last for decades with proper care and maintenance. Trekkies call them as “Tribbles”. Other names for Marimos are algae balls, Cladophora ball and Lake Ball. 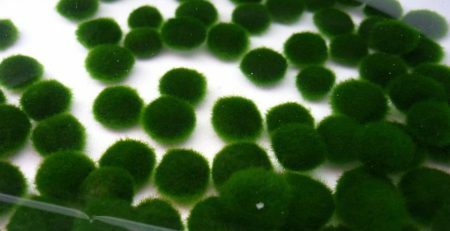 Each year, Japan Celebrate the Marimo Matsuri or the Spherical Algae Festival in commemoration of their National Treasure during the early week of October for 3 days. 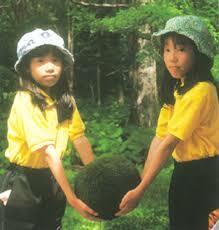 Marimo Balls are considered a good luck charm for love and prosperity. Legend has it that there were two lovers who want to be together for the rest of their lives, but when things got in the way and prevented them to live together, they fell into the waters and became Marimo balls. You can place a beta fish with a Marimo moss ball together. 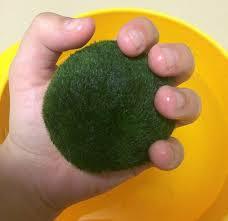 Marimo Balls grow very slowly; they only grow 5 millimeters per year.